IMPORTANT: Please use your highest level of qualification achieved when completing this section. If you have a qualification from a non-Irish institution you must go to www.qualificationsrecognition.ie to find out where you are on the National Framework of Qualifications. Your application will be reviewed on the basis of the information provided on this form, however copies of the above certificate(s) will be required by SQT. Important: This section should only be complete if you have ticked "No" to the question above. Admission to undergraduate programmes is based upon prospective students, with considerable life and work experience, demonstrating evidence of their ability to undertake the programme. The focus of APEL is upon the skills and knowledge gained through experience. The outline below uses generic indicators. Generally, level equates to issues of autonomy (how closely students have been supervised in their roles/ how much responsibility they had) and the complexity of the task/role or context (how complex were the issues and tasks experienced). A minimum of 2 years’ experience in a position where engagement in problem solving, quality assurance or project delivery is required. Prior training as a Yellow Belt, Lean Practitioner plus 1 year experience in a position as described above. 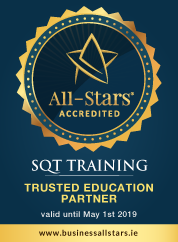 SQT will supply you with relevant statistical software which must be loaded to your laptop in advance of the course.